The inside of these structures contains an adhesive and a vial of female pheromones appropriate to the type of insect that it seeks to control. Using these traps it’s possible to follow the arrival, presence, and development of the insect cultures and prevent possible generational peaks. The generalized use allows for mass capture of the male insects and leaves the eggs unfertilized, and is useful for understanding the cycles of existence of the moth and the olive fruit fly. Pheromone traps are, however, rather expensive. 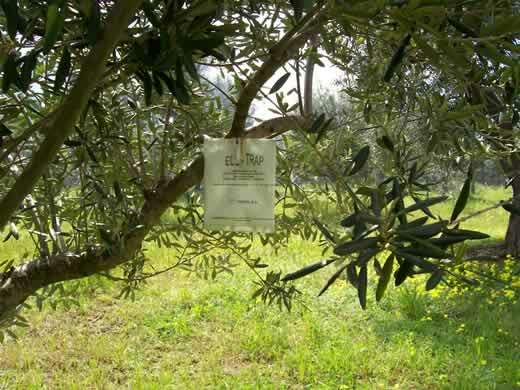 Of relatively moderate cost, the bag trap is used for the mass capture of the olive fruit fly; new traps are installed regularly. Basically it consists of a bag soaked on its outside surface in Deltametrina, which comprises an attractive food for both male and female insects. It acts on contact. 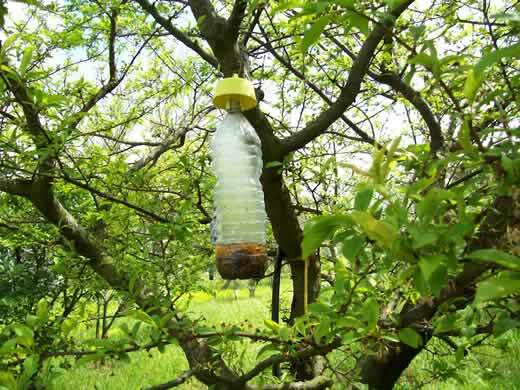 Having very low costs, the bottle trap is used for the mass capture of any insects dangerous to any of our plants. It is comprised of a unique yellow top (with an Italian patent) that is fastened to the branch, and of an ordinary plastic bottle, recycled from household use, inserted beneath this top. The bottle contains a half-litre of water and an odour attractive to the type of insect that we wish to capture. With a sardine, we can attract all types of flies (olive fruit flies, fruit flies, common flies, blowflies) and wasps; with red vinegar, sugar, and a little mint, we can attract lepidopterans, moths, and hornets. Basically, the colour yellow attracts the insects from far away; the odour attracts them under the yellow top; and the insects then enter into the bottle opening and get stuck inside, amassing in impressive numbers. 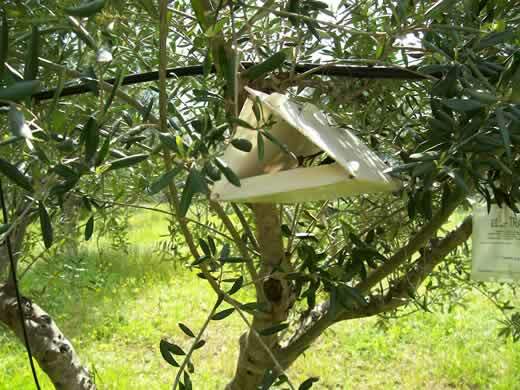 This technique, with very low costs and considerable results, works for any type of flying insect, provided that we use the correct odour for the specific type of insect that we wish to trap. 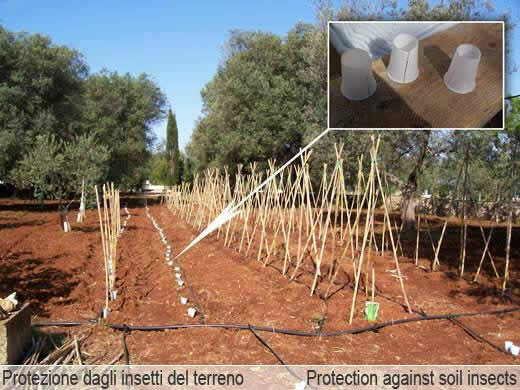 These traps consist of bands of acrylic fibre wrapped around the trunks of olive trees (especially young ones) to obstruct crawling insects (and especially the weevil) from climbing up the tree, damaging the soft leaves and hindering the plant’s development. The insects, black and nocturnal, catch their feet in the acrylic fibres of the trap and can’t move; the daytime sun then kills them. Currently we’re testing ways to trap the Rodilegno, which digs destructive tunnels in the tree branches (in its larval phase) and trunks (in its moth stage). If there is an unusually high incidence of Margaronia on the delicate tips of the olive tree, we use the Bacillus Turingiensis, Kurstaki variety. In these last two cases the development of the trees, not forced by chemical fertilizers, is more gradual and “diverse”; the plants seem stronger and less “appetizing” to the insects. 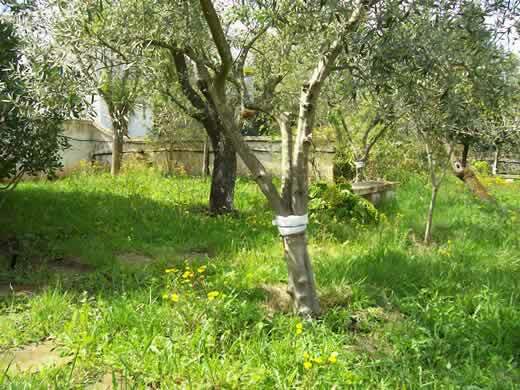 Also in progress are tests to contain the Carpocapsa (Cidia molesta) that attack apple trees. 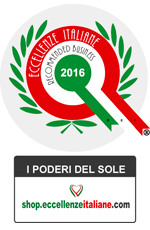 IF YOU HAVE EXPERIENCES RELATING TO ANY OF OUR ACTIVITIES, WE INVITE YOU TO CONTACT US. THANK YOU.